If you keep an eye on Indiesew (as you should! ), you know that Allie, the brain behind this lovely pdf pattern store and online community, launches four collections each year, consisting of different patterns that go great together. This time around Allie has planned something special – a pattern cooperation with Seamly! Seamly is a US Company sewing and selling basic high quality garments for women and children, all of them are sewn in the US. Thanks to Indiesew it is now possible to sew three of these garments at home! 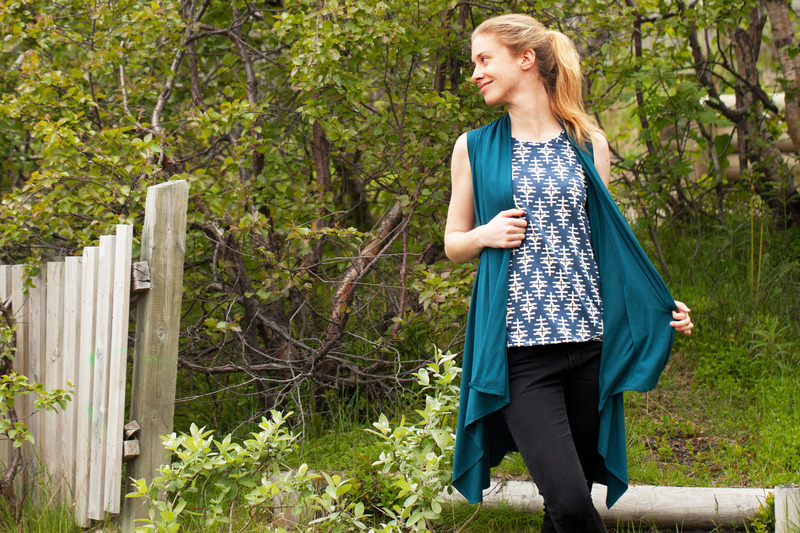 Allie made pdf sewing patterns for the Vallynne Tank, the Basic Tee and the Wrapped Cardigan and these are now part of this year’s Summer Collection. I tested all three patterns, some of them even using fabric from the Indiesew shop, and am excited to finally show you what I was busy sewing weeks ago. The Vallynne Tank is a loose fitting tank with an optional pocket, designed for knits with some drape. It is finished with bands, but Allie is also going to show an alternative method for finishing the neckline and the armholes on the blog. Regardless of the fabric recommendations, I made this tank of cotton lycra – a beautiful design by April Rhodes for Art Gallery Fabrics. You can see how the top is a little tent-like – that’s because of my fabric choice. I made another version in a thin and super drapey viscose knit, and that one looks totally different! Have a look at Allie’s blog, she has a post showing the Vallynne made of three different types of fabric. But I really like my Vallynne Tank since I don’t mind having some wider, not figure-hugging staples in my wardrobe. The Basic Tee – as the name already tells you – is a basic tee with short sleeves and an optional pocket. It’s pretty wide and long, perfect for everyday use and super comfy. The shoulders are pretty wide and I think they are perfect for my figure: a lot of other patterns might be a little too narrow for me at the shoulder area, but this tee sits right at the edge of my shoulders. I guess I should do a shoulder adjustment much more often, but well, I don’t… And with the Basic Tee I don’t have to, either! I made the tee of this fabric from the Indiesew shop, I think it is actually overstock fabric from Seamly. It’s a beautiful knit – it’s soft and has some drape, but without being thin and flimsy – a rare combination! The Wrapped Cardigan is a very versatile garment. It can be made with or without sleeves and can be worn open or as a dress with a belt. I am pretty tall, so this unaltered version of the cardigan might be a little short as a dress, but I’d love to make a longer version one day! And of course a version with sleeves, too. The cardigan comes with two hidden Pockets, one on each side, sewn into the bands of the cardigan. These pockets aren’t designed for walking around with your hands in them, but they are great for storing a few small things in them, for example a credit card or lip gloss. You can see a glimpse of the pocket on the picture below. I used a jade coloured rayon spandex knit from the Indiesew shop for my cardigan. This particular colour is sold out now (I’m not surprised, it’s so beautiful!! ), but the same fabric is available in a few other colours. I have mentioned before that we have midnight sun over here right now, which means that it’s light around the clock. I’ve recently been asking my friend Angelique, who takes all my photos, so many times to take pics, that I wanted to spare her and asked my husband to take a few pics in the midnightsun this time. But I am so spoiled by Angelique’s photos that those pics just weren’t good enough for me and Angelique had to take some new pics at the nearby playground (yep – these were taken at a playground! And I realized while editing that I forgot to wear make-up… that’s why I’m looking so tired!) But the light was magical and I thought I’d share a few of the pics with you – believe it or not, they were taken around midnight. And I really have to give a shoutout to my husband – he was so patient and did his very best, just to make me happy. Head over to Indiesew to buy the whole collection at a reduced price, or to buy just one of the patterns. And don’t forget to visit the blogs of the other participants of the blog tour – they’ve made some beautiful garments! Great versions of all three! I love the cardigan especially, it looks great belted like that! Thank so much, Helen! I was a little unsure about having a sleeveless cardigan at first, but now I love wearing it! Gorgeous pictures and sews! I especially like the cardigan. Thanks for the reviews!